When a surgical shoe or CAM boot based system is the preferred offloading approach, you may want to consider dispensing a FORS™ -15 Insole as your offloading interface. FORS™ Insoles provide consistent and durable offloading and cushioning in the shoe-based devices that your patients prefer to wear. What makes the FORS insole different from other offloading insoles? Novel Plug design creates highly stable offloading zones. Plugs that are not removed remain stable and solidly in place without shifting or falling out. 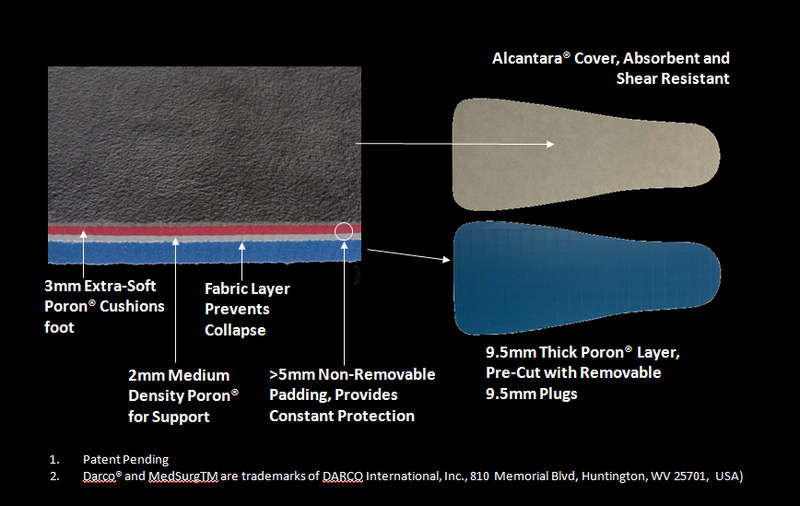 Fabric mid-layer disperses force along offloading zones to eliminate edge effects and prevent "bottoming out"
Best in class materials, including: Alcantara® fabric on top to minimize sheer and absorb fluid, and Poron® memory resistant foam for excellent resilience, cushioning and shock absorbance. Insoles can easily be trimmed for custom sizing and completely disinfected as needed. As a podiatrist or allied healthcare provider, you are well aware of the serious health risks that foot ulcers pose for your patients with diabetes - studies show about 1 in 6 individuals with diabetes will at some point develop diabetic foot ulcers, and approximately 14-24 percent of diabetic patients who develop a foot ulcer will require an amputation. 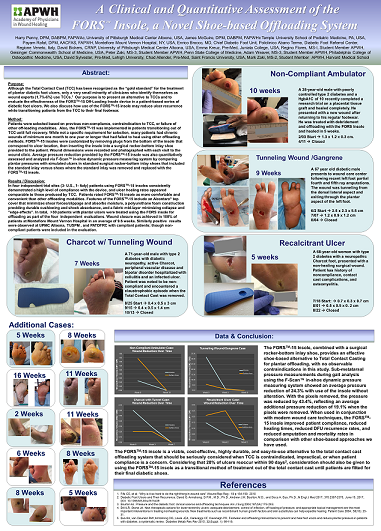 It's also well-known that diabetic foot ulcers (DFUs) are the single greatest cause of lower extremity amputations in the United States every year, and that such amputations have been tied in studies to a 5-year mortality rate that approaches that of lung cancer. It is also well established that effective offloading is one of the keys to healing diabetic foot ulcers. At Bonapeda™ Enterprises, we recognize that when treating plantar ulcers, the most commonly employed offloading techniques involve "shoe-based" methods. We have good news for you and your patients - the FORS™ insole has demonstrated excellent clinical results and was proven in a recent study at Temple University to offload 43.4% of the force from the targeted area. To view and download a copies of various clinical presentations, click on the link(s) or images below. Click here to see TUSPM study results, presented APMA National, July 2017. See what users of the products are saying! Contact Bonapeda to see how the FORS insole could contribute to positive outcomes in your practice. Bonapeda™ Enterprises is the exclusive distributor for all Saluber® products in the United States. To learn more about how the FORS insole can provide an excellent shoe-based offloading option for your patients, send us an e-mail (customercare@bonapeda.com) or call us at 973-415-9090.